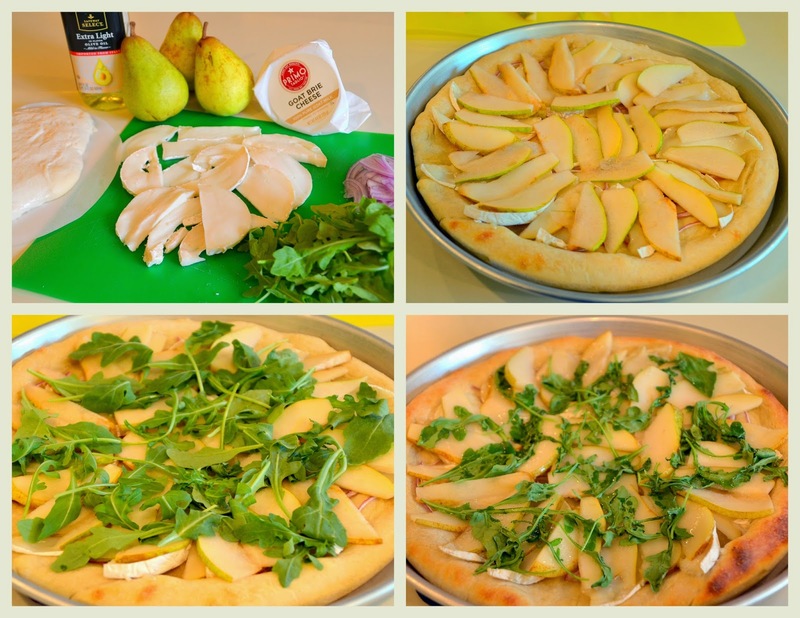 This Brie, Pear and Arugula pizza would be great for an appetizer. I used a pound of store bought fresh pizza dough found in the deli section which really made this easy to make. If you want to make your own dough here's a link to one of Kathy's recipes for pizza dough. 1 small round of Brie (4 oz.) sliced. Prepare pizza pan with a little olive oil to coat. Prepare a surface with a little flour to roll out your pizza dough to fit your pan. Transfer dough to pan and stretch to fit nicely. Top dough evenly with the red onion slices. Bake in oven for up to 12 minutes until the dough is golden. Remove from oven and turn the oven to broil. Carefully add the Brie and Pears evenly on the dough. Salt and pepper these ingredients to your taste. Scatter the Arugula on top of the Brie and Pears. Place pan back in oven set to broil and watch very carefully removing just after the Brie melts. Cut into serving portions and enjoy. It looks wonderful but I would have to grow my own arugula and make my own goat cheese as stores here don't carry those items. I'll look at Wal-Mart when I go today but I think I looked for goat cheese before and to no avail. But I may subsitute provolone or feta with the pears (I think they'll have those...LOL!) and maybe another green for the arugula? Any suggestions on the green part? Sam, any cheese that you can imagine would go good with pears would work beautifully. And yes you can substitute the greens, too. Any kind of Brie would work, too. My store had a small goat brie and that's why I chose it. A havarti cheese would be real good, too. How did I miss this post!! This looks delicious Ellen. What a great combination of flavours and so, so pretty! Seems like a crazy combo until you eat it...WOW...delicious! Served it to company, told them they were guinea pigs, crazy new recipe, they said they will be guinea pigs anytime! Great way to expand my pear repertoire and my waistline!